As result of new tax provisions involving 1) Commercial energy efficiency, 2) Smart Grids and Smart Meters and 3) The ability to earn substantially more energy tax credits, utility tax departments have a much more expanded and important role within their companies. Here, utilities have two tax opportunities; First, they can obtain EPAct Section 179(D) commercial building energy tax deductions for their own facilities, and second, if they have efficiency programs for rate payers they can integrate the Section 179(D) benefits into their own energy efficiency promotion programs. Pursuant to Energy Policy Act (EPAct) Section 179 (D), building owners or tenants making qualifying energy-reducing investments can obtain immediate tax deductions of up to $1.80 per square foot. Utilities are often large organizations with property portfolios that typically include office buildings, auto/truck garage facilities, workshops, power plants and substations. It is important for utilities to install energy efficient lighting, lighting controls, HVAC and HVAC controls that in many cases will be eligible for Section 179(D) benefits. Some utilities will install new product technologies in their own facilities before recommending them to rate payers. Utility tax departments should make sure that their own operations are aware of the EPAct lighting wattage targets so that the utility itself qualifies for the same benefits that rate payers are encouraged to meet. It is particularly important for utilities to replace prior generation metal halide and T-12 lighting that is barred from further manufacture in the United States. Utility tax departments should ensure that they are achieving the same EPAct tax benefits for replacing these products as are their commercial rate payers. Many utilities have large sales forces whose sole functions are to promote energy efficiency to the utility’s customers. It may seem counterintuitive, but utilities can actually save money by deferring large power plant investments, and the public service commissions that approve rate increases often require demonstrated achievements in energy reductions before approving further utility rate increases. For example, most utilities in the major demand-constrained markets (including the Northeast, California and Texas) have efficiency programs. Ratepayers will only participate in these programs if it makes economic sense, and the addition of EPAct tax savings to the energy savings and utility rebate program is often the exactly what is need to make an efficiency investment economically worthwhile. Accordingly, it is very important that utility tax departments guide their energy efficiency team members in promoting EPAct tax commercial energy efficiency tax benefits simultaneously with efficiency programs. Many companies ranging from venture capital startups to large companies like IBM, Cisco and GE are investing in smart grid/smart meter equipment, or making other investments that require additional smart grid/smart meter investments. Smart grids enable utilities to greatly improve efficiency; they are critical for handling the two-way electricity arising from the net metering related to fast-growing alternative energy investments such as solar and wind. Smart meters enable electricity end users to view their electric usage information and consequently decide how to manage energy use. Over ten million utility end users are in the process of receiving smart meters� and prospectively many new mainstream household appliances incorporate smart meter functionality. Recent tax law changes allow for quicker depreciation of eligible smart grid and smart meter equipment, and many utilities have received large stimulus grants to support smart grid and smart meter purchases. 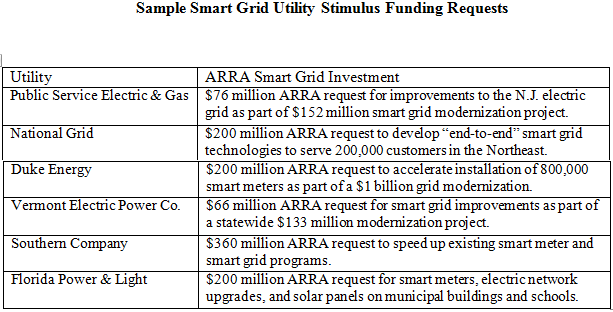 The American Recovery and Reinvestment Act (ARRA) contains $4.5 billion in stimulus grants for smart grid projects. The chart presented below illustrates some of the many smart grid stimulus requests filed by utilities throughout the country. Moreover, there is an increasing convergence between smart grid and software applications. Utility tax departments should be upgrading and tagging their fixed asset systems to recognize eligible equipment purchases, and developing tax depreciation polices covering smart grid versus software depreciation determinations. Pursuant to the Emergency Economic Stabilization Act of 2008, the prior prohibition on utilities obtaining tax credits from power purchase agreements related to customers has been removed. This is a major policy change and provides powerful financial incentives for utilities that need to expand alternative energy use both for demand management and required emission reduction. Moreover, as a result of the expansion and extension of wide range of alternative energy tax credits the utilities have a lot more energy tax credits to work with and the certainty of availability. This means that many rate payers that don't have tax capacity may be interested in structuring a power purchase agreement with the utility, whereby the utility will utilize the tax credit. In addition, in July 2009 the government announced the details of the new grant program which provides the economic equivalent of all the tax credits in the form of a grant. Forward-looking utility tax departments should be working closely with their legal and operational counterparts to ensure that tax is properly integrated into all of these fast growing initiatives. Some major utilities are involved in various alternative energy projects including Austin Energy, Florida Power & Light (FPL), Portland General Electric (PGE), PacifiCorp, Sacramento Municipal Utility District (SMUD), Xcel Energy and Public Service Electric & Gas Co., along with California utility Pacific Gas & Electric (PG&E). “Because PG&E has a ‘tax appetite’ and can take advantage of the tax credit, the utility is investing directly in solar energy,” according to PG&E CEO Peter Darbee in a CNET article this spring. The table below summarizes some of the major utilities’ alternative energy investments. As a result of major changes in Federal policy involving commercial building energy efficiency, smart grids, smart meters, alternative energy credits and grants, the role of tax departments in utilities has greatly expanded. This is a new and exciting area for tax professionals interested in implementing America's energy policy initiatives.